Sessions was confirmed as Senate Democrats are putting up fights against several of Trump's Cabinet nominees. 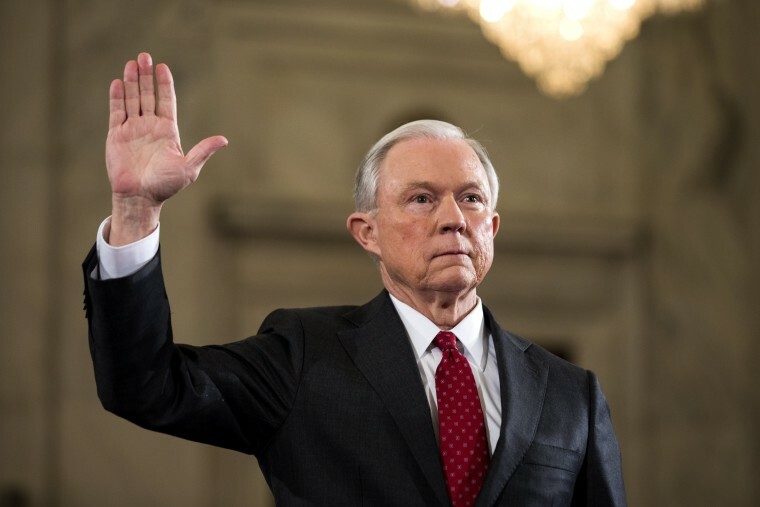 Democrats held the Senate open for 55 consecutive hours by the time of Sessions' vote as they thundered away in opposition to two of the president's most controversial nominees. And in the middle of debate on Sessions, tensions boiled over Tuesday, when Republicans voted to formally rebuke Sen. Elizabeth Warren, D-Massachusetts. The unusual move to reprimand Warren for "impugning" Sessions came after she read aloud a letter by Coretta Scott King in opposition to his 1986 judicial nomination. The episode, which dominated discussion Wednesday, was emblematic of the frustrations both parties are experiencing over a confirmation process for Trump's nominees that continues to slog on. Democrats, who don't have votes to stop nominees without Republican defections, are using their time on the floor to slow the process and register their objections to nominees they feel are unqualified, by resumé or ideology. Next up is the confirmation of Rep. Tom Price, R-Georgia, to be health and human services secretary. Democrats didn't plan to use the same tactic, at least not Wednesday night. "They know we're going to be successful, so stunts like staying up all night and making speeches — I'm not sure who they're trying to impress, other than their dysfunctional base, by stopping and slowing down these confirmations. which will be successful eventually," said Sen. John Cornyn, R-Texas. "It's not neat and orderly," Risch said. But he added that he's seen a change since Trump was elected. "There's been a real spike in anger, hate and bitterness since the election," he said. And Cornyn said the Senate needs a break. "Everybody just needs to get a good night's sleep," he said. Democrats continued their floor speeches Wednesday in opposition to Sessions, but they also had additional momentum to support their colleague Warren. Warren's censure has further emboldened Democrats, even spurring the hashtag #ShePersisted, using the words of Senate Majority Leader Mitch McConnell, R-Kenrucky, as a badge of honor. "It's totally uncalled for," Minority Leader Chuck Schumer, D-New York, said of Republicans' maneuver to bar her from the debate. Sen. Bernie Sanders, I-Vermont, meanwhile, said Warren was owed "an apology." "I think it's unconscionable and outrageous that Senator Warren isn't allowed to participate" in the debate to confirm Sessions, Sanders said. The Democrats' all-night session has been most wearing on the non-political employees who staff the Senate floor, including the stenographers, who are exhausted. THANK YOU to the police, clerks, stenographers, cloakroom staff, pages, & Sen officers who worked all night while @SenateDems #holdthefloor. DeVos was the most contentious nominee the Education Department's history, garnering the support of only 50 senators, plus the tie-breaking vote of Vice President Mike Pence — setting up what's already been a week of divisive politics in the Upper Chamber.